1. Place the crushed shortbread into a medium sized mixing bowl. 2. Melt 200g white chocolate and 3 tbs coconut oil together and add to the crushed shortbread, stir to combine. 3. Add the sprinkles, stir to combine and set aside. 1. Place the crushed oreos into a medium sized mixing bowl. 2. Melt 200g dark chocolate and 3 tbs coconut oil together and add to the crushed oreos, stir to combine and set aside. 1. Line the base of a 20cm round deep, and loose based cake tin (or cake tin of your choice) with baking paper. 2. To support the cake while its freezing use the two pieces of clear plastic sheet (acetate) or thick cardboard to make the tin taller by placing it around the inside edges of the cake tin, they should overlap most of the way around so there are no gaps. 3. Place ¾ of the shortbread sprinkle mixture into the bottom of the prepared cake tin, press down the mixture and spread it out evenly. 4. Add ⅓ of the vanilla ice cream, and spread evenly with the back of a spoon. 5. Add the rest of the shortbread sprinkle mixture crumbling over the ice cream, sprinkle over an extra 2 tbs of sprinkles. 6. Add the next ⅓ of vanilla ice cream, and before smoothing it out, add the strawberry sorbet and an extra spoonful of vanilla icecream and then smooth over with the back of a spoon, allowing the ice creams to swirl together a little. 7. Add the oreo chocolate crunch layer. Then add the rest of the vanilla ice cream, smooth over with the back of a spoon and add some extra sprinkles on top. 8. Place the cake into the freezer overnight or for up to 2-3 days. 9. When ready to serve, melt the 200g white chocolate and 2 tbs white chocolate and set aside to completely cool. 10. Remove the cake from the tin and place onto a serving plate. 11. Drizzle the white chocolate mixture* over the cake and then place the cake back into the freezer for 10-15 minutes to allow the chocolate to set. 12. 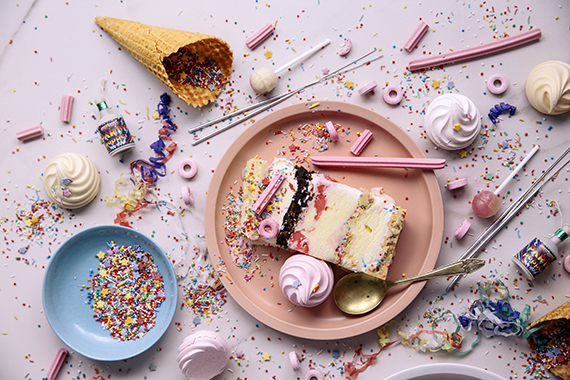 Remove the cake from the freezer and decorate with waffle cones, mini meringues, lollies and extra sprinkles. Enjoy! 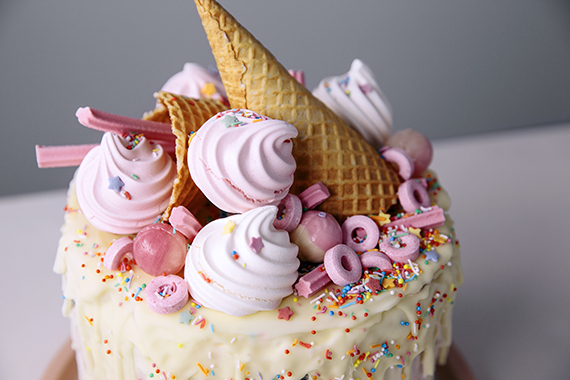 *The white chocolate drizzle is optional, you can add the decorations straight onto the ice cream cake if you don't want to add the white chocolate over the top of the cake.